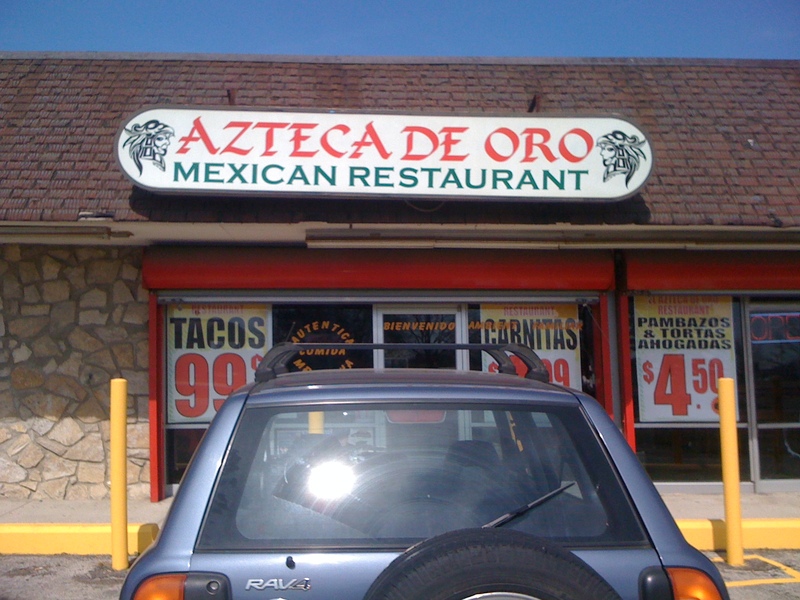 I don’t know that I’ve ever said this about a restaurant before, but Azteca De Oro is, well… cute. Not unlike most of the restaurants we’re reviewing here, it’s an assemblage of the second-hand: start with the bones of an old restaurant, add tables, chairs, and whatever else you can scrounge up, maybe hit a few walls with paint. Sometimes this approach adds up to something more than the sum of its parts, other times… not so much. In ADO’s case, it comes together with an unaffected, well worn, cheerful charm (that the photos, unfortunately, do a bad job of conveying). ADO’s menu is extensive and clearly oriented towards a Mexican customer base. With offerings like huaraches, gorditas, menudo and pambazos, these guys operate as though their competition is the taco trucks (which, as far as their Mexican clientele are concerned, they probably are). This felt like familiar territory, so I figured I’d put them to the test by ordering the tacos campechanos – a plate of 5 tacos, each with a different meat inside – and washing it down with some horchata. 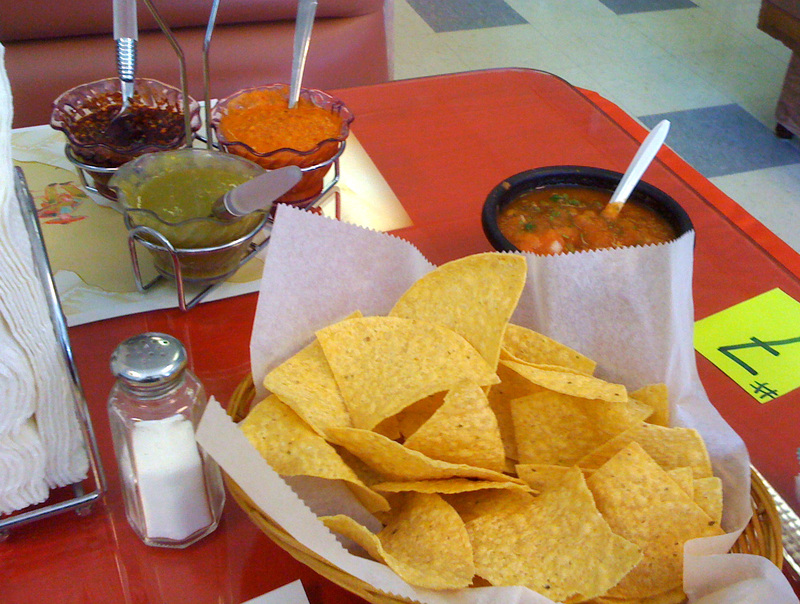 Chips and a nice selection of salsas came out. The tortilla chips were fine, but the salsas were the star – conspicuously fresh and flavorful. The lighter red-orangeish salsa was a standout – smoky, garlicky, and with a nice hot kick. The deep red stuff packed a searing spicy heat punch. The horchata, a sweet rice milk beverage flavored with cinnamon and vanilla, was there to help take the edge off. 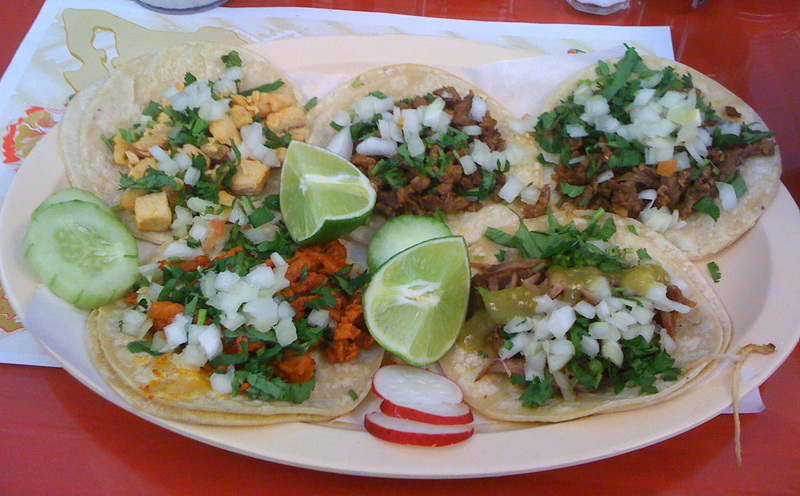 Al pastor (seasoned pork) – About as good as al pastor gets without being spit-roasted. A satisfying, big-flavored option. Cecina (cured beef) – Nice flavor, expectedly chewy. Great with the smoky salsa. Pollo (chicken) – excellent seasoning, but a bit on the tough side. Cochinita (marinated shredded pork) – Very tender, subtle flavor, best with the green sauce. Overall, the tacos were solid, authentic, and certainly taco truck worthy. Vegetarian options were scant to non-existant. ADO also serves breakfast, and with huevos rancheros, chilaquiles, tamales as well as other egg options. It’s feels slightly odd having chips and salsa at breakfast time, but once they’re there it’s hard to resist. We sampled both the rojo and verde chilaquiles and preferred the red. The verde option was too acidic (lime and tomatillo heavy) for our taste. 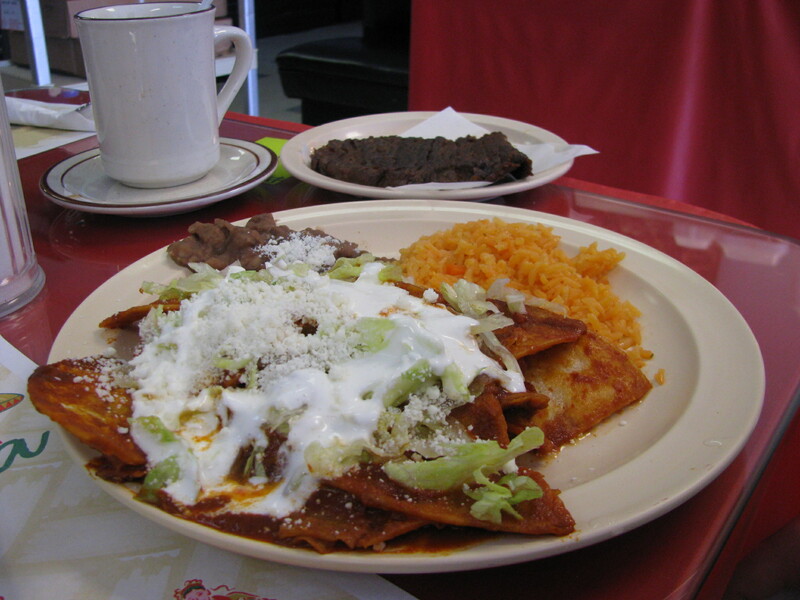 Chilaquiles are cut up corn tortillas fried and served with chili sauce. They are served to use up leftover tortillas and as a hangover cure. 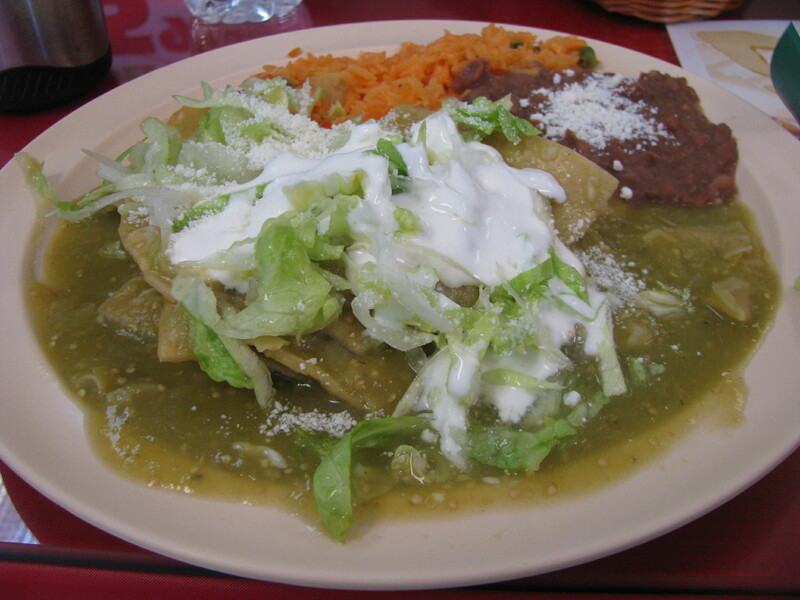 At Azteca de Oro they are topped with lettuce, sour cream and cheese and served with rice and beans. This entry was posted in Mexican, Restaurant and tagged breakfast, chilaquiles, Mexican, pambazo, tacos. Bookmark the permalink. This looks so good! I’ll have to check them out for breakfast. Chilequiles are my favorite breakfast food. Do they (or any of the taco trucks for that matter) have fish/shrimp taco options? I’m not a complete vegetarian, and still eat seafood but I don’t know if these places offer many seafood options…. ADO did have a good bit of seafood – shrimp, ceviche, whole fish, and a caldo de mariscos (soup with shrimp, octopi, and fish). They didn’t list most of the filling options for the tacos anywhere, though, but I’d imagine they could be persuaded to make a fish/shrimp taco if they don’t already. The taco trucks that were reliable for seafood seem to have either disappeared or closed down for the winter. The only one I can think of is Tacorriendo, who did (does?) ceviche on the weekends. Tacorriendo does fantastic fish ceviche year-round. They seem to have it everyday unless they run out. We have eaten it all thru Cuaresma. I’ve eaten there, and it is delighful. Excellent quality and quantity. Taco Nazo does (or at least did, the last time I visited) a really good ceviche on the weekends. La Casita (sit down restaurant on Bethel) does an awesome fish taco and ceviche and octupus, a bunch of different shrimp dishes, and has one of the best table salsas in town. Cuco’s does a great ceviche too. There used to be a pink taco truck on Sullivant that did all seafood, but I haven’t seen them out there this year. A lot of the restaurants, if they have the ingredients on hand, are more than willing to make them with seafood options. Some are better about it than others, but the two I mentioned above are especially good about it. Went for breakfast 5-15 and the rojo chiliquiles were really good but the beans were excellent. It tasted as if they had been refried with a bit of chorizo grease since it had that extra flavor though I didn’t see any chorizo bits. It was about 9 on a Saturday and my breakfast companion agreed beans were excellent and that the rice was in much better shape than many restaurants. Eggs over easy on the side were a really oily but were served on a plate with a tortilla which soaked up much of the oil. On the plus side I now know what to do with my left over chorizo grease. We just ate here and it was excellent! I had the chicken quesadilla served with the usual suspect of sides which was huge and delicious! My boyfriend had the alambre, a dish of steak tips, ham peppers, and onions covered with delightful cheese and served with tortillas and sides. He said it was very good, but he prefers the pazole, which he said is possibly his new favorite soup. He brought home his leftovers and I agree it is very tasty. It consists of a slightly spicy broth brimming with shredded slow cooked pork shoulder and beans and was accompanied with a plate. Of additional add-ins such as jalepenos, onions, cilantro, lime wedges, avacado and radish slices. Another item we tried was the choripollo, strips of seasoned chicken, peppers and onions topped with chorizo and cheese. It was also yummy and delightfully presented, albeit a bit greasy, but that’s to be expected with chorizo. A warning – these portions are huge!!! Be prepared to take home leftovers. Overall we found the service to be very friendly and the food to be fantastic and we will definitely be going back to try more items from their extensive menu.